You have a million of these, I bet. Tubes and tubes of shiny, sparkly, glitterized, iridescent, pearlized, frosted, moisturizing, plumping, long-wear, scented, and unscented, lipgloss. When you have the shopping bug, and that pair of stilettos are just a wee bit out of your budget, purchasing that tube of yummy glossiness is so easily justified! It's so easy to collect these little impulse buys when it is so easy to spend $14.50 on that Kiehl's Lip Gloss, or even splurge on the luxuriously shimmery $30 YSL Golden Gloss. I've done (do) both. A lot. And I would be willing to bet you a free makeover that 90%-No, wait-at least 95%- of these little precious gems in your RubberMaid bin are pretty darn close to the same exact shade of color. Am I right?? Of course I am! Why is it that when you visit the makeup counter you naturally gravitate toward the color we A) already own at home or in our purse, or B) it's twin sister? Because like every other makeup product adoring, er, obsessed, woman out there, you are constantly on the hunt for that perfect shade of pinky-beigey-nudey-glossy wonder that is magically going to appear into your lives like the Holy Grail, or some kind of mystical makeup prophet. Well, ladies, I hate to be the one to break it to you, but I promise you that the sweet smiling girl behind the Laura Mercier counter is not keeping this secret of the ages from you out of spite. Give the poor girl a break. The truth is, no lipgloss, or any other product or color is perfect, right? Because what is perfect to you may not read as perfect to Miss Laura Mercier Rep, and most likely, will become less perfect to you the day that you find the next perfect one, and they will all end up in the RubberMaid bin at some point! Well, all that said, while my favorites may not be perfect for you, they are pretty darn close. And I would recommend these picks to any makeup junkie who wants to discover their next little tube of almost- perfection, for whatever occasion it calls for. Anyone that follows my blogs or knows me personally knows how much I love this brand. 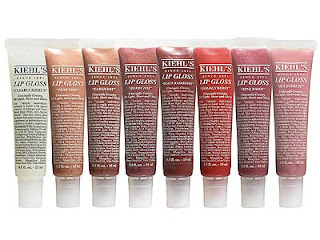 Since 1851, Kiehl's has been putting out some of the very best skincare and beauty basics, with their lip products being no exception. I love this non-sticky Apricot Oil based moisturizing gloss for it's texture, easy application, and tote-ability, and have one in almost every color. I have been a fan to this sister of MAC Lipglass since it made its' debut back when I was slinging gloss behind the MAC counter myself. 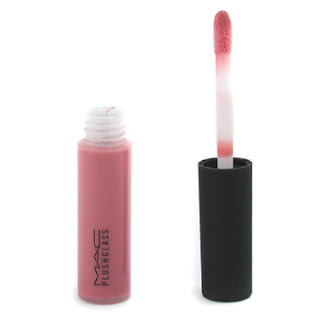 MAC Plushglass has a silkier feel, goes on super juicy sheer, and has a fresh minty, not stinging, plumping effect. My favorite go-to colors are Ample Pink ( A great Bridal pick!) And Fullfilled, a lovely sheer peach. These little babies always seem to beckon to me from their 2 for $20 bins on line to the cash register. It works every time. Great job, Victoria's Secret. 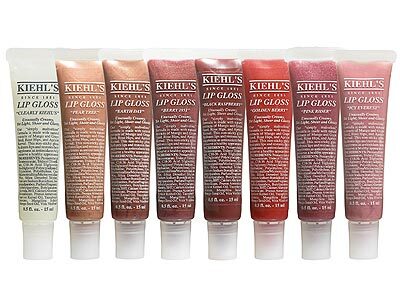 This gloss, while on the bit on the stickier side, are super duper shiny, come in tons of fun juicy colors, and they smell and taste quite delightful. My favorites? Cherry Bomb and Lemon drop. Yum. Sometimes that 'perfect' shade of peachy-pinky-nudey-beige doesn't really cut it after all, and we do need just a little splash of color to make things all right. These are my picks for that type of lipgloss situation. This gloss has been a staple of mine since two of my dearest friends were schlepping lipsticks right along side me from their posts at the Stila counter. 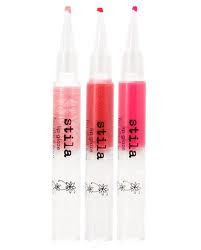 Stila Lip Glaze is fun, fun to use, and comes in amazing colors. While a touch pricey (Stila has actually lowered its' pricing over the years, believe it or not!) it really is a great little goodie. I bet if you go on their website right now you will find a fantastic little gift set of colors, but the two I love best for a color pick-me-up are Fruit Punch and Raspberry. Did I mention they smell and taste divine? Another great one to keep in your purse for that little splash of extra color is Flashmode Lustreglass by MAC. Similar in texture to Plushglass, but without the plumping effect, this gloss has a sweet raspberry hue with a touch of shimmer. So on a lovely weekend away with some girlfriends in Carmel, after shopping and wine tasting and spending too much money, I stumbled upon this little beauty in a boutique style shop, and had to have it. Now, I know I could have just as easily picked this up at home at Nordstrom or Sephora, but it's just sooo much more fun, and easier to splurge on yourself on a little jib while on va-cay, don't you think? I think I annoyed my girlfriends for months with my "ooh-la-la"ing over pulling this lovely number out of my bag. 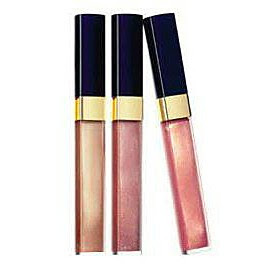 But YSL's Peony, a gorgeously sparkly balance of pink and gold gloss is worth every fabulous touch up, and penny. What is your latest lipgloss obsession? No keeping secrets, now! I've shared mine, please share your below...I will be busy making space in yet another drawer of my RubberMaid bin.